The Salt Lake City Cemetery was established in September 1847 when George Wallace, who arrived with the first company of Mormon pioneers two months prior, buried his young daughter on a picturesque hillside above the Salt Lake Valley. It has since grown to become the largest municipal cemetery in the United States, containing approximately 130,000 gravesites. To walk through the Salt Lake City Cemetery's 120 acres is to trace a path through Utah history and experience a mosaic of the diverse and fascinating individuals who have shaped it: politicians, pioneers, artists, inventors, outlaws, educators, activists, and currently 12 presidents of the Church of Jesus Christ of Latter-day Saints. This book highlights these influential figures and many more. It also serves as a guide for navigating the cemetery grounds in person, with grave locations accompanying most captions. 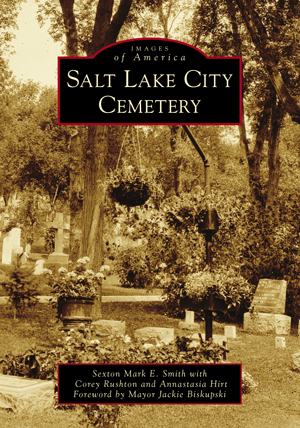 Mark E. Smith has served as sexton of the Salt Lake City Cemetery since 2002 and is its longest-serving sexton. Corey Rushton is a seventh-generation resident of the Salt Lake Valley and has held numerous elected and appointed civic positions. Annastasia Hirt is an accomplished English instructor and has a passion for researching local history.